Everyone loves dashboards. Quick snap shots that save laborious reading and highlighting. And everyone loves new tools that leverage cloud data and APIs to display data in real time - in customizable, flexible, easy to assimilate views. Marketing and predictive data around revenue are newer targets of data curation. But the ease of collection and display of data is rapidly diminishing its value. It's so cool; so interesting to review data sets which couldn't feasibly be collected before, that companies are creating vast noise which is obscuring the signal. We're drowning in data. Collecting data isn't the challenge anymore. Deloitte says "As analytics becomes a C-suite imperative, many business leaders are exploring ways to establish or tap into ecosystems to extract and exploit insights from growing volumes of data." 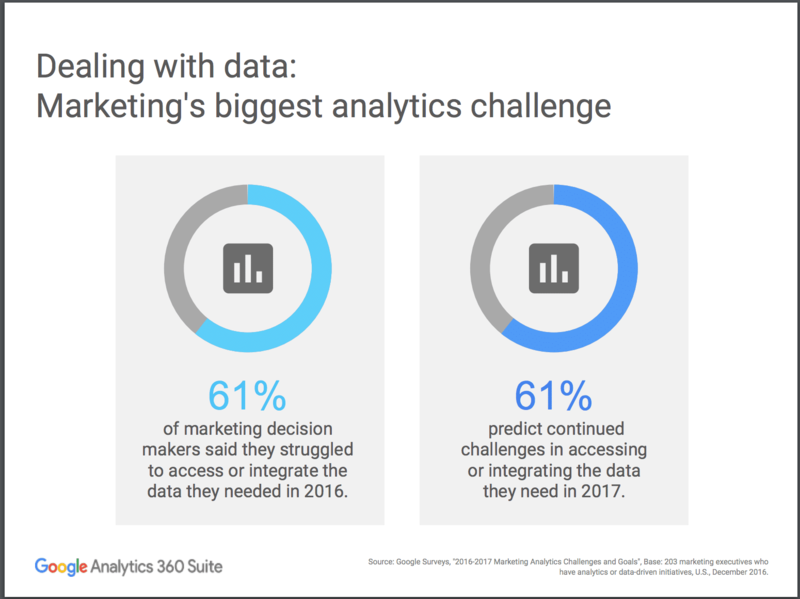 This slide from a recent Sloan Management Review webinar on marketing data (on demand / slide deck) illustrates the challenge. Getting the right data on which to base decisions is a barrier. Five years ago the hidden formulas in spreadsheets, wasted time in cutting and pasting and inherent opportunities for error in both meant that the best option wasn't great. Today the mechanics of access, collection and reporting are simple - DataBox.com is part of the toolkit that I provide clients of my revenue growth program, and a simple interface to create incredible, real-time, mobile accessible data views. And it's all done without submitting a ticket and complex project spec to the IT department! Everyone can now easily see multiple versions and perspectives of virtually any sales and marketing related metric - and even create custom formulas to demonstrate relationships between them. Accessibility of data is now a given. And I've seen that unleash a flurry of "so cool" reports for every exec - daily updates, metrics on every KPI, instant alerts of over & under performance, and dashboards crammed with info. And I've seen them promptly ignored. Opened and digested for a couple days; then opened and skimmed for a couple more; then summarily deleted without opening shortly thereafter. "Cool" capability doesn't drive business - fundamentals do. Much has been written about the absence of marketing strategy from many content marketing programs. The prevalence of absurd and irrelevant blog articles and social media posts validates that claim. Less frequently discussed, though, is the disconnect between corporate strategy and revenue growth strategy. Like elementary school math, these must build on each other. When that's done properly corporate goals are reflected and directly supported by revenue growth goals which are in turn reflected in tactical execution steps. When that's missing, however, marketing is likely to gleefully shower senior management with data designed to illustrate the success of their initiatives. The result, counter intuitively, is to exacerbate the perception of unaccountable marketing effort. Simply burying someone in data inures them to the potential value and demonstrates a lack of understanding of what they need. "What someone needs" obviously varies by position and responsibility - and it's defined by a companies multi-level strategic plan. It's easy to assume that revenue is the key number, but for a CEO who's interacting with investors in a company with a long, complex sales cycle, pipeline or percentage of projects with new accounts could be the critical insight. In industries wracked with uncertainty around sales channel disintermediation, direct vs. indirect metrics could be key. And for companies preparing for a liquidity event, demonstration of a predictable, repeatable acquisition model could be important to valuation. As much as marketers would love to throw volumes of data at management to validate their tactical success, doing so validates the impression that marketing isn't a scientific discipline that's widely held among the finance, sales and operations folks that run businesses. The biggest data challenge has become, therefore, identifying the 2-3 data points that are specifically relevant to each person based on their strategic imperative. Separating the critical signal from the noise is now the priority as the data noise is deafening. There's another level of data which bears mentioning - that's the data which enhances a company's balance sheet. Data which reflects activities and performance is a management tool. And it's where most companies stop. In the B2B sales space, however, IoT (internet of things and the related IIoT or industrial internet of things) is creating an entirely new data opportunity as companies consider PaaS (product as a service) models. In a B2C example, Mars has committed to acquiring data throughout the sales channel to understand trends which impact beyond the scope they've normally been able to observe. In B2B and capital equipment sales the opportunity is larger. By integrating IoT technology into their offerings, companies can simultaneously create new revenue opportunities AND accumulate data which becomes a potentially valuable asset and source of other revenue opportunities. For instance a company which collects performance data as part of a monitoring and alert service can use that data to understand OEE, maintenance and industry specific trends. That understanding can be incorporated as value added insight in PaaS subscriptions or even packaged and sold as new consulting products. Just as delivering key performance metrics requires strategic understanding, architecting and visualizing data opportunities for asset growth and service extension does too. This should be high on the list of board and senior management discussion at every business. There must be a framework for capturing and leveraging data. Not sure where to start? Download this Strategy guide which provides questions designed to provoke and guide the discussions which middle market manufacturers need to be having.